I know you love the recipe for cauliflower buffalo wings, but now I’ve kicked it up a notch. I think you’ll probably keel over after trying one bite of this buffalo cauliflower sandwich with creamy ranch. 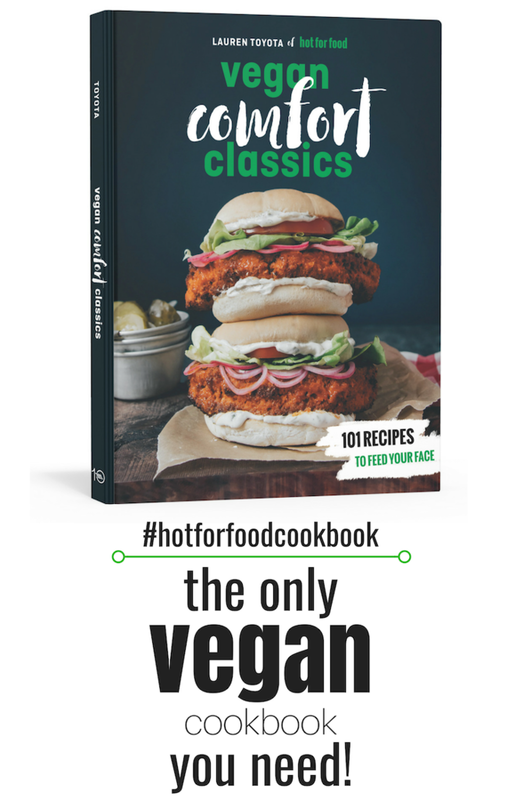 If you have a copy of Vegan Comfort Classics: 101 Recipes to Feed Your Face, then you know about the suped-up version of the buffalo cauliflower. It adds Panko breadcrumbs on the outside after battering it all up! Don’t forget that essential step. You're going to love this lighter twist on a buffalo chicken and ranch sandwich... drool! Line a baking sheet with parchment paper and preheat oven to 450°F. Trim off any green leaves at the base of the cauliflower, but leave most of the stem in tact. Cut the head of cauliflower in half and then cut 2-inch x 1/2-inch steaks from each of the inside sides. You can use the remaining cauliflower to make buffalo wings or just use it in another recipe like my mushroom sage cauliflower risotto. Roasting it in the oven with sea salt, ground black pepper, and olive oil is delicious, too! Mix the flour, nondairy milk, water, spices, sea salt, and ground black pepper in a mixing bowl with a whisk until well combined. Transfer this mixture to a wide shallow baking dish that will fit your cauliflower steaks. Dredge the steaks through the batter and use your hands to coat them quite well, getting in all the crevices. Place the battered cauliflower steaks onto the parchment lined baking sheet and bake for 25 minutes. Meanwhile, prepare the ranch sauce and buffalo sauce. In a bowl, whisk all the ingredients together for the ranch. Refrigerate until you're ready to assemble the sandwiches. Just before the cauliflower is finished baking, melt the vegan butter and whisk it into the hot sauce in a shallow dish you can dredge the cauliflower steaks in once again. Remove the cauliflower from the oven. You may want to let them cool so you can handle them. You might need to replace your parchment paper if it's really soaked through or burned quite a bit. Dredge the cauliflower steaks through the buffalo sauce, making sure to coat them evenly. Bake again on a parchment lined baking sheet for 25 minutes. To assemble the sandwiches, spread ranch on both sides of a toasted kaiser, then lay down the buffalo cauliflower steak on the bottom, add red onion slices, lettuce, and thick cut tomato slices. You could cut the cauliflower steaks in half to make 4 smaller, slider style sandwiches. I’ve got a whole head of cauliflower in the fridge but I’m just one person! Do you think there is a way to make these ahead and keep in the fridge? I’m thinking that it might be possible to put in the fridge after the first bake and then do the second bake when I’m ready to eat, what do you think? We have made them and then refrigerated them. We reheat them in the oven or a pan again and it’s fine, but they might lose their crispiness a little. It’s not like they’re really really crispy when you bake them the first time anyway but they will seem a little soggier. I’m totally fine with it though and they taste amazing still! You could also make buffalo cauliflower steaks for sandwiches if you wanted to use more cauliflower at once. Check our site for that recipe too but it’s essentially the same in steak form! Made these tonight. OMG so YUMMY!!!!! My husband made these tonight and they were as delicious as the picture! Thank you for such a great idea and recipe. Will be making again and again….We didn’t have fresh dill or chives; used cilantro and fennel to the vegan mayo and it still had a nice herby flavor. Thank you!! Looking forward to trying more recipes of yours. i don’t have a lot of experience cooking so my question may be a little naive but frank’s red hot sauce won’t be easy to get where i live and there’s also the thing with me not being a fan of spicy foods. do you think i could just skip it? or perhaps use a different sauce? Yes you can definitely use any sauce you want really. BBQ or honey garlic… anything goes. You could even do a little lemon juice and ground pepper and sea salt. Yum! Let us know what you try and how you like it. Even snap a pic and share it with us on instagram or twitter! Made these sandwiches for my parents for dinner last night … the first warm spring evening in Southern Ontario! We barbecued the cauliflower instead of baking it, and added vegan ketchup to the buffalo sauce before brushing it over the cauliflower steaks on the grill. Everything turned out absolutely amazing, and we served the steaks on spelt toast with spinach, avocado/guacamole, and shredded carrot. Thank you for another wonderful recipe! on the bbq sounds amazing! we’ll have to give it a try this summer 🙂 Thanks so much for sharing your experience! 1 word…AMAZING. i will be making this again and again and again. It was also super easy to make. I made these for dinner tonight. There was a chorus of OMGs going around the table, and I was told I "hit it out of the park". I will be sure to look for more of your recipes. Thank you! Hi, I just made these for my husband and they were great, but very hot, like burn your face off hot!!! I used Tabasco sauce and next time, I don’t think we’ll use as much. Oh isn’t tabasco WAY hotter than Frank’s? John loves it with Frank’s but I myself find it too spicy. I usually cut it with a BBQ sauce. Try some other flavours maybe. Thanks for checking us out! awesome! Thanks so much for checking us out! 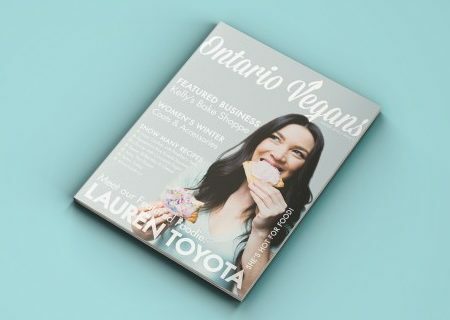 Is there a printer friendly version for these recipes?? I’ve made the cauliflower wings with this batter and LOVED them, I ate the whole head. I’m curious if this batter would work for onion rings, and I guess I will just have to give ‘er a go! I’m in love with your blog and videos! I’m addicted to looking at all of the recipes there are. I noticed there are a few recipes that require vegan mayo. I’ve never had this and I don’t want to go buy just any kind. What do you use? Or can you recommend a good vegan mayo I can buy? Thanks so much! Hot for Food never disappoint! U BOTH SLAY! Had these tonight, followed recipe verbatim. They were delicious! Vegan burgers are hit or miss for me! These were definitely a hit in my household. My son loved it and had no idea I used cauliflower. Seriously yummy! The ranch (i like to say dill) sauce made it. Such a perfect balance with the buffalo sauce and to think I almost used a blue cheese dressing instead! Thanks for sharing! This was absolutely fantastic! 100% will make again – many, many times! Thanks so much for this recipe! It turned out delicious!! I also used the same batter and a wee bit of hot sauce on tiny cubes of firm tofu and it tasted like ground meat! Just finished eating this and I have to say this is one of the most amazing recipes I have made in a while, So nice to find a vegan recipe that is a change of pace. Many thanks I’m new to your content and look forward to trying other recipes. So the Kaiser roll is vegan ?!? I just finished this for dinner and I must say this was the best vegan sandwich I have ever made. I absolutely love your recipes! THIS was AMAZING!!!! I opted for store bough buffalo sauce but holy cow…. It was so good! The texture of the cauliflower was spot on and the seasoning gave it umph. In love! sometimes store bought buffalo sauce contains butter. just FYI, unless you’re not vegan! Thank you! Thank you. My husband who doesnt like cauliflower enjoyed it and my sister in law and I loved it. Even my 14 year old son liked it. I’m not one to write comments on recipes and I really should. I made this last night and it is AMAZING. Thank you so much for the great recipes! Hi! All your recipes seem great. I just have one question – I live in Europe and I have no idea what "frank’s red hot sauce" is – would a regular hot sauce like sriracha work? I approve BUT frank’s is the type of hot sauce used for hot wings, where as sriracha is going to be SUPER hot unless you cut it with something like maple syrup. So you could do a maple lime sriracha sauce or something. Just to cut the heat! This has turned out to be one of those ‘too good to be true’ recipes for me. The batter mostly dripped off and it hardened in an odd way – it peeled right off the bottom side of the cauliflower when I turned it over. I halved the recipe and used almond milk as the dairy-free milk, and I had to add extra flour because the mixture was very runny. The flavours were great but it just wasn’t crispy and the temp was too hot for the cauliflower so the edges burnt slightly within the first 15 mins of cooking. I just watched the cauliflower wings video which is pretty much this recipe but in a different form and my batter looked exactly the same. I did use parchment paper so I think the temperature must have been the issue. Maybe it was hot enough to burn the cauliflower but not hot enough for the batter? I have a gas oven, not fan forced. Hey guys, I’m about to make these today and was just wondering: do we REALLY need vegan butter? I don’t have any on hand right now (ok Im a little lazy to go buy it right now lol)…. Can I substitute it with anything else? I made this tonight and it was outta-control-GOOD!!! I loveeee buffalo – but don’t super love cauliflower – and this was major yum! I didn’t have parchment paper so I used aluminum foil and it stuck pretty bad so when I put them back in for the sauce coating I did them on a wire rack and it turned out perfect. These were amazing ! Thank you so much for this recipe ! I’ve made these three times now and third times the charm! The first two times I accidentally added the hot sauce and vegan butter into the batter, it would be helpful if you said all ingredients except those two for the batter so other people don’t get confused. Now that I did it correctly it was a hit! Thanks for the recipe. "Happiness is sharing …", it is our emotions along the lines of your sharing. It’s just words but we thank you for giving so much love to it, a shared spirit with the plight of the gangsters in the street and the ads. Workers at the time of New Year’s Eve but still working diligently to wake up tomorrow will return the streets clean beautiful welcome the new year. I love this type of dish with so much variety of ingredients, thanks for sharing this great contribution !! This is such a perfect flavor profile! My husband and I were blown away, thank you for such a great recipe! have you tried adding concentrate to some recipes?